You know those little mazes printed on kids' menus? My tykes love 'em, but usually they're done in about 30 seconds. 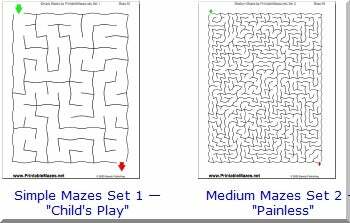 If you'd rather get a mountain of mazes in one fell swoop, you can buy a 250-page printable maze book for $9 (which seems a little steep to me). The site is owned by Savetz Publishing, which offers a boatload of other printable-stuff sites, including contracts, coloring pages, recipe cards, and even play money. Definitely worth checking out.